My relationship with Nablus has a deep emotional connection with the figure of my late father Jamal Badran. He was the relater and transmitter of the imagery of the old city: its unique heritage, architecture and important history. When I visited Nablus, for the first time, I perceived the city through his eyes. Jamal Badran was an artist and an expert in Islamic arts and crafts. He played a decisive role in preserving Islamic arts and crafts in the whole region during his entire life. One of his major projects was to restore and recreate the drawings of Al-Minbar of Al-Aqsa mosque after its destruction in Jerusalem. He displayed mastery in the design of Arab-Islamic decorative patterns and in the art of calligraphy on a range of materials, including: leather, parchment, paper, fabric, marble, stone, tiles, Hebron glass, mosaic, plaster and wood. My installation is a homage to his art. 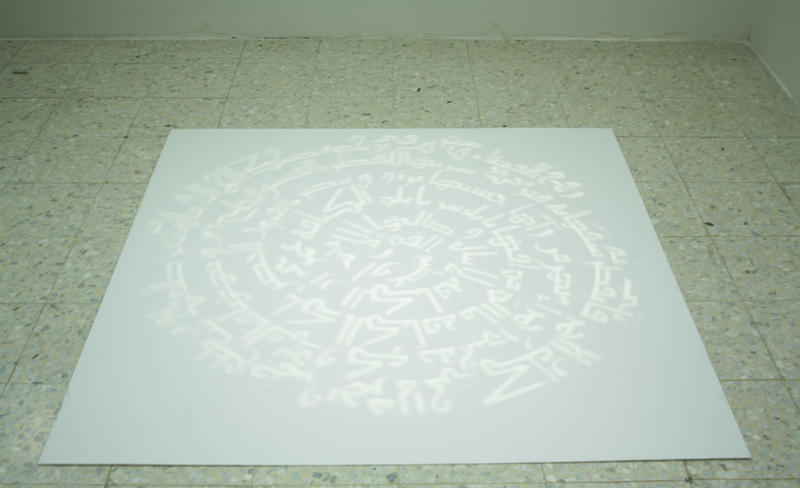 With the metaphor of a huge lamp shade illuminated by the sun, and following his steps, I carved by hand an arabesque design and a geometric pattern inspired by his work using a Kufic calligraphy to inscribe a poem by Walid Al-Kilani. In the past, public spaces were a splendid reflection of the artistic and handicraft culture of the place. Nowadays, due to the occupation and the economic situation, this aspect is nearly nonexistent. I want to recreate these aesthetics in the market, where the soul and the authentic essence of old Arab cities is strongly represented. One of the characteristics of Arab markets is the use of colored textiles hung over the old narrow streets so that pedestrians are shielded from sunlight. In this fascinating and genuine setting of light and shadow, I will hang my installation on Badran Boulevard. A vivid, ephemeral installation, based on light and shadow and related to the physical space where time will leave its traces; transforming the landscape yet at the same time bearing testimony to the city. The projection of the light will change continuously in density and shape, depending on the angle of the sun, and the shadows will move over the people walking down the aisles and up on the walls, eventually immersing the entire area below with a carpet of abstract designs. This intervention will be integrated and will remain there in order to form part of the vocabulary of the urban elements that already exist. But it will also have a visual connection to the Islamic heritage of the city as well as a daily reminder of my father, the artist Jamal Badran.